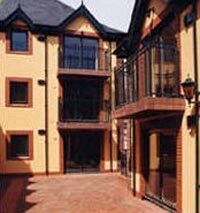 The Shaw Court Apartments are located just two minutes walk from The Harcourt Hotel in Synge Place. The apartments were open in July 2000.The pickup point for keys and all administration is at the Harcourt and the guest is escorted to the apartments from the Harcourt. Security is a top priority and the apartments have pass codes which are required for main gates and all access doors. Each apartment has its individual alarm system. The guest will enjoy a peaceful nights sleep knowing that they are safe and secure. The Shaw Apartments are available nightly, for weekends, weekly and monthly lettings. Consisting of one and two bedroom apartments with a futon in the living room which will provide extra bedding if required. The apartments are perfectly furnished to very high standard and all modern conveniences from washing machines to microwaves are provided. The tasteful décor and wooden floors provide a nice homely atmosphere. These are self catering holiday apartments. But there are many excellent food stores from Dunnes Stores to Marks and Spencers close by. There are also a wide variety of restaurants and cafes to cater for all taste buds. Dublin is famous for its pubs many of which provide excellent pub grub and carvery lunches while extending the friendly hospitality which is a hallmark of Irish society. The Shaw Court Apartments are located right in the heart of everything this cosmopolitan city has to offer. Shopping in Grafton Street and Henry Street is a delightful leisurely experienced. The main theatres, many well known and famous pubs and the main tourist attractions are all close by. For the visitor a visit to Temple Bar is a must. Temple Bar has lovely little shops, a wide variety of pubs, cafes and restaurants, a laid back bohemian atmosphere and the hottest night life in town.